Add high-speed Wireless-N connectivity to a desktop or laptop system through USB 2.0. The USB300WN2X2C USB Wireless Network Adapter lets you add 300 Mbps Wireless-N connectivity to your desktop or laptop system through USB 2.0. 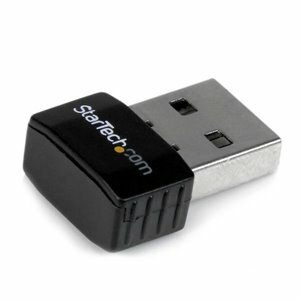 With a compact, lightweight design, the adapter is extremely portable, and is unobtrusive when connected to your system - you can even leave it connected to your laptop when in a carrying bag, without worrying about damaging the adapter or the host port while on the move.The USB wireless adapter is capable of data transfer rates up to 300Mbps over a 2.4GHz 802.11n WiFi network (backward compatible with 802.11b/g), through a 2 Transmitter / 2 Receiver antenna design. The adapter also supports security options such as WEP, WPA or WPA2, as well as quick device connection through Wireless Protected Setup (WPS), for a reliable and secure connection. With a compact, lightweight design, the adapter is extremely portable, and is unobtrusive when connected to your system - you can even leave it connected to your laptop when in a carrying bag, without worrying about damaging the adapter or the host port while on the move. The USB wireless adapter is capable of data transfer rates up to 300Mbps over a 2.4GHz 802.11n WiFi network (backward compatible with 802.11b/g), through a 2 Transmitter / 2 Receiver antenna design. The adapter also supports security options such as WEP, WPA or WPA2, as well as quick device connection through Wireless Protected Setup (WPS), for a reliable and secure connection.